During the summer I was faced with the rather daunting prospect of graduating and not quite knowing where to go next. Therefore, I thought applying for a summer placement through Equate Scotland’s Careerwise scheme would provide me with a great opportunity to gain some valuable work experience whilst also hopefully giving me a steer on where I would like to take my future career path. 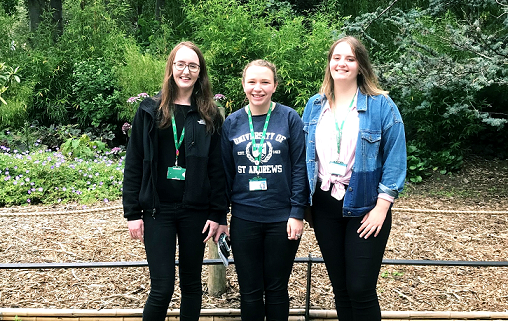 After submitting an application and attending an interview I was lucky enough to be one of three female students/graduates to gain a 3 month Geographic Information Systems (GIS) placement with the Forestry Commission as part of their Planning Support Team over the summer. Having just graduated in Geology & Physical Geography at the University of Edinburgh I had been exposed to a fair bit of GIS work throughout my studies and had always found its application interesting and the maps you could produce with it pretty cool. However, all GIS work that I had done before had been focused on rocks or rivers, so working with the Forestry Commission provided me with a completely new industry to get to grips with! Throughout the summer the work I was able to get involved in was varied and interesting, and I got to use GIS in ways I hadn’t before. Projects included developing electronic field diaries to be used by foresters out in the field, creating online dashboards to interactively summarise data and creating web-maps to display and analyse data. And although GIS can often be about staring at your computer screen there were also some great opportunities to get out and about, and learn about different aspects of work undertaken within the Forestry Commission and the wider forestry industry. This included going on site visits with forest planners and landscape architects, and also the opportunity to visit and work in offices across Scotland – from the Highlands to the Borders (we even managed to have a meeting at Edinburgh Zoo once as well!). As well as getting to meet people from across the Forestry Commission, there was also a chance to visit and talk to employees at Scottish Natural Heritage (SNH) and Scottish Environmental Protection Agency (SEPA). At the end of my summer placement I was offered the chance to stay on and continue working with the Forestry Commission. Having enjoyed my work over the summer so much I was delighted at this opportunity. Since the summer I have still been able to continue working on web and mobile GIS projects, whilst also providing GIS support for tree health issues across the National Forest Estate to both national and district teams. Alongside day-to-day work there has also been opportunity for training and development. I have been able to attend ESRI (the industry leader in GIS) professional training courses to further consolidate my GIS skills, and also attend their annual Scottish Conference. A big part of what made the summer placement, and my continued work, at the Forestry Commission so enjoyable has been the wonderful team and colleagues that I am surrounded by and get to work with. From the very first interview I was made to feel welcome and comfortable within the organisation. The team have always made me feel fully supported in the work that I am doing, and there is always someone there to help you or answer your questions when you need it! There has also been great support provided by Equate both prior to and after the summer placements finished. Before the placements began Equate held a very useful pre-placement workshop. This allowed us to meet fellow students that we were going to be on placement with and the opportunity to put faces to names and network with other female STEM students did help calm any pre-placement nerves that might have been going around! Likewise after the placements had finished we have also been given support on important issues going forward, such as CV’s and interview skills. Overall, doing a Careerwise summer placement with the Forestry Commission has definitely been a fantastic experience. I now have GIS skills and knowledge that I definitely did not have over 6 months ago when I first started at the Forestry Commission. Furthermore, I have been given the chance to see how integral GIS is to the running of a large organisation and how I can use my skills to contribute to this – something which I was not able to learn from university.